If you’re a competitive player and enjoy travelling to different locations to play Pickleball, Alberta is home to many tournaments. Most of these tournaments use www.prickleballtournaments.com as their registration destination and an avenue for posting information. We recommend following up with local clubs direct if you have questions on when they will do that or when their registration is. 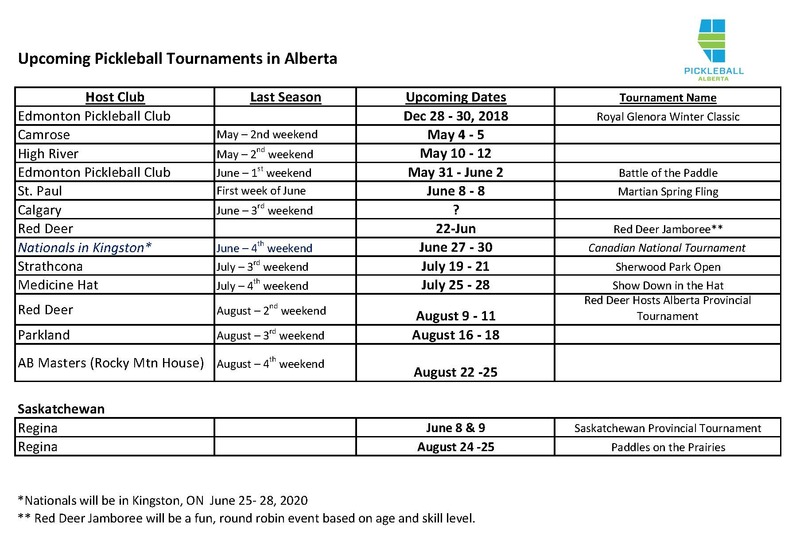 Pickleball Alberta has compiled a list of Alberta tournaments and the date they play to be hosted. Reserve those dates in your calendar and watch for announcements or check back on www.prickleballtournaments.com in the new year. Red Deer plans to post tournament information in January, and I would anticipate registration would take place in March. The Red Deer Jamboree is intended to be a skill and age-based tournament, and we’re anticipating the new courts will be up and rolling. The August Red Deer tournament will the 2019 home of the Alberta Provincial Tournament. We’re expecting a bigger tournament on 20 new courts this year. should be a lot of fun. More details in the near future. ← Where and When Can I Play Pickleball?